The songwriting duo are seen in the summer of 1961, the year before they landed their record deal and scored their first chart hit with Love Me Do. Author and Beatles expert Mark Lewisohn is to publish the shot in a special edition of his new book The Beatles - All These Years: Volume One: Tune In later this year. Lewisohn, who has written six previous books about the Fab Four, bought the picture from a fan in the band's home city of Liverpool two decades ago, but it has not previously been in print. 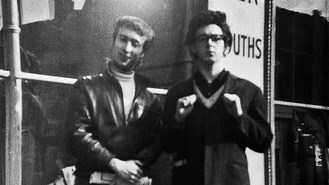 Lennon and McCartney had been friends for around four years by the time the image was taken and had become closer after Stuart Sutcliffe had left the line-up in December 1960, opting to stay on in Hamburg with girlfriend Astrid Kirchherr while the rest of the band returned to Merseyside. A little over two years later the group had topped the charts and were barely able to head out on the streets without being mobbed. Lewisohn's book is being published by Little, Brown on October 10, with the special edition coming out on November 14.